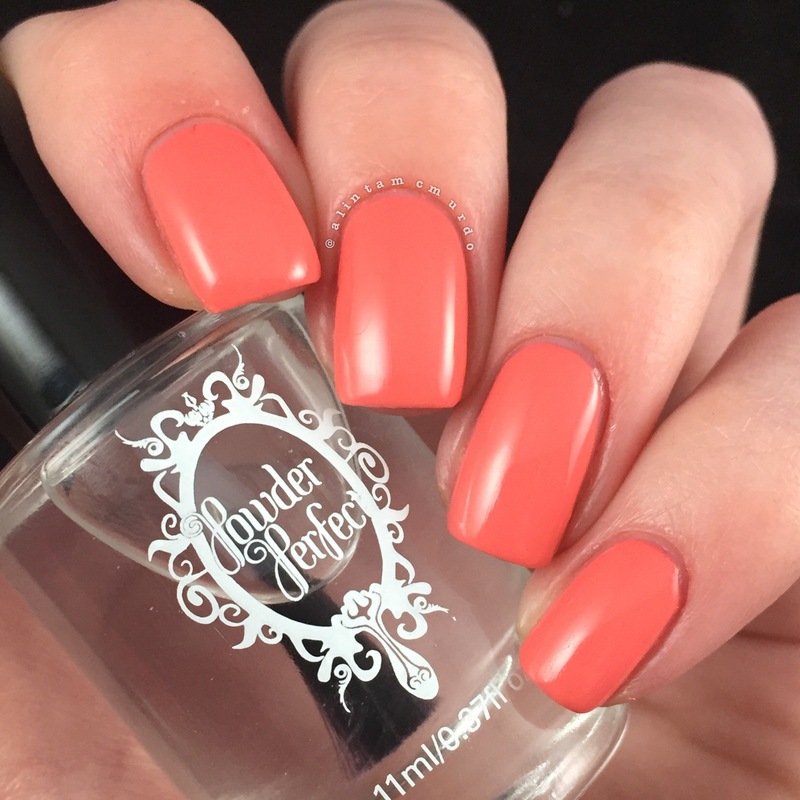 Powder Perfect recently released a beautiful trio called the Bermuda Collection. It is inspired by the famed Bermuda Triangle ‘dead zone’ and consists of three bright cremes, Bermuda, Florida and Puerto Rico. Before I swatched these polishes, I read some reviews on them, so I knew in advance that it would be difficult to get colour accurate photos of them, but I wasn’t prepared for how hard it would be. I tried various lighting set ups, different backgrounds and lots of hand poses to see if anything would make them appear colour accurate. I have managed to get photos that are more colour accurate than what my standard set up gave but I suggest you google these polishes and have a look at some other swatches so that you can get a better idea of what they look like in different lighting. All three colours are so beautiful in person, I just wish I could show you exactly what they look like. 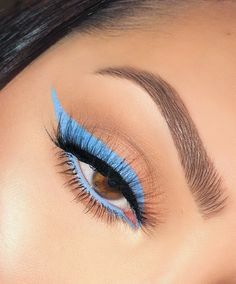 The three shades remind me of a lost island in the tropics, which fits perfectly with the idea of the Bermuda Triangle. 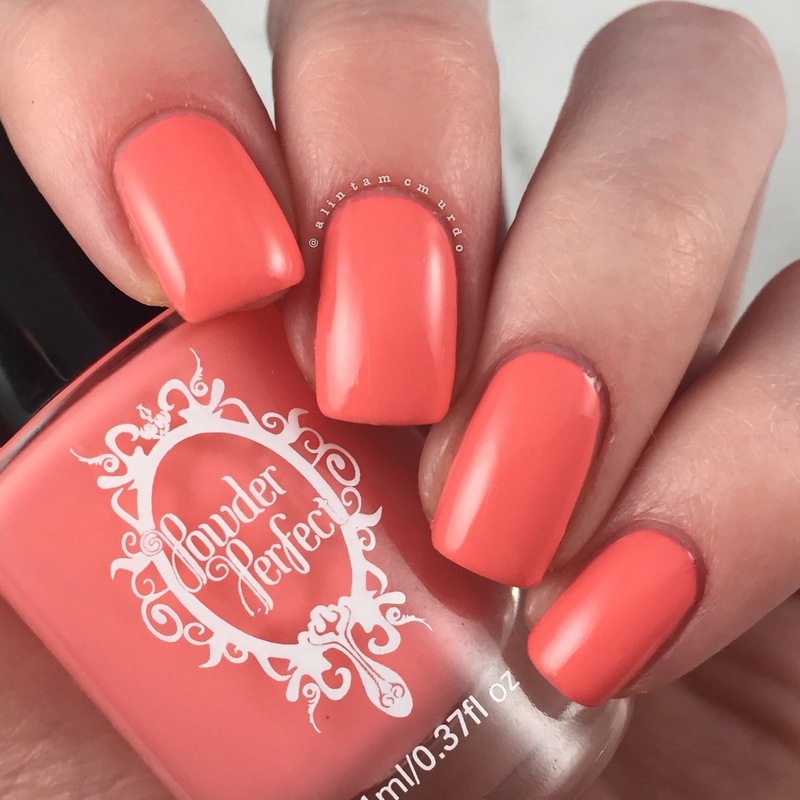 Florida is a lovely coral cream that has a lot more pink in it than I have seen in most swatches. I have chosen the most accurate photos that I was able to capture which is pretty close to the actual colour of the polish. I had to swatch this twice because the first round of photos made it look like a bright orange. 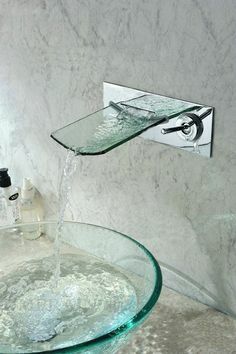 Florida has the thinnest formula out of the three but still very easy to use. I did three coats to make sure it was completely opaque but you could get away with two if you used a thick second coat to cover up the streakiness of the first coat. 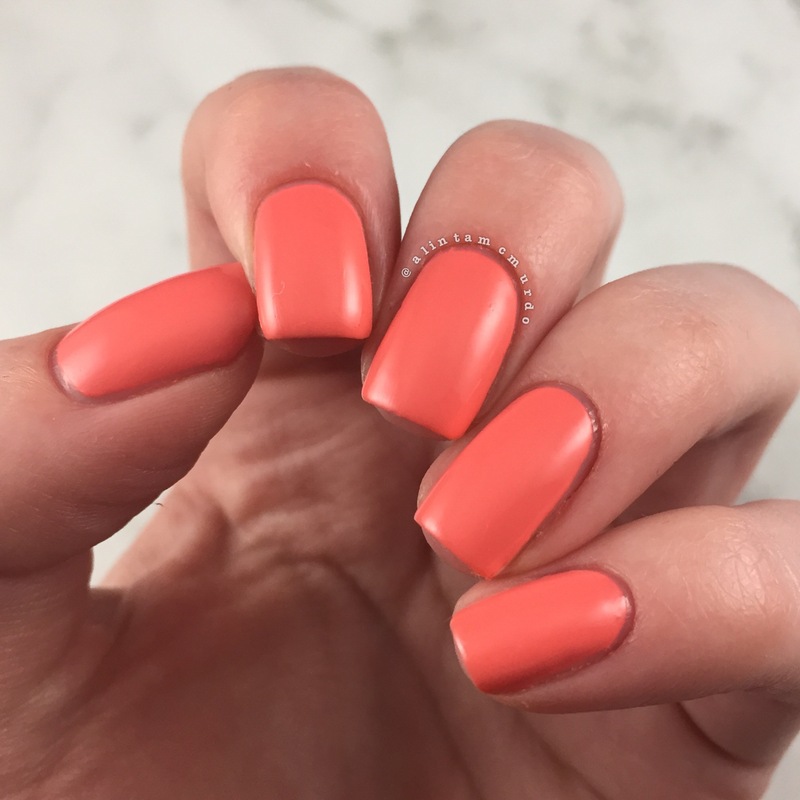 I adore this colour, the pink lean makes it so flattering on my skin tone, unlike some other corals. It is the perfect colour for summer but I also love it right now to cheer me up in the middle of winter. Puerto Rico is a true vibrant purple creme. This one tended to lean very blue on camera but I was able to get some colour accurate shots after a while. This polish was the thickest of the three, making the application a little harder. I ended up adding one drop of thinner just to make it glide along the nail easier. 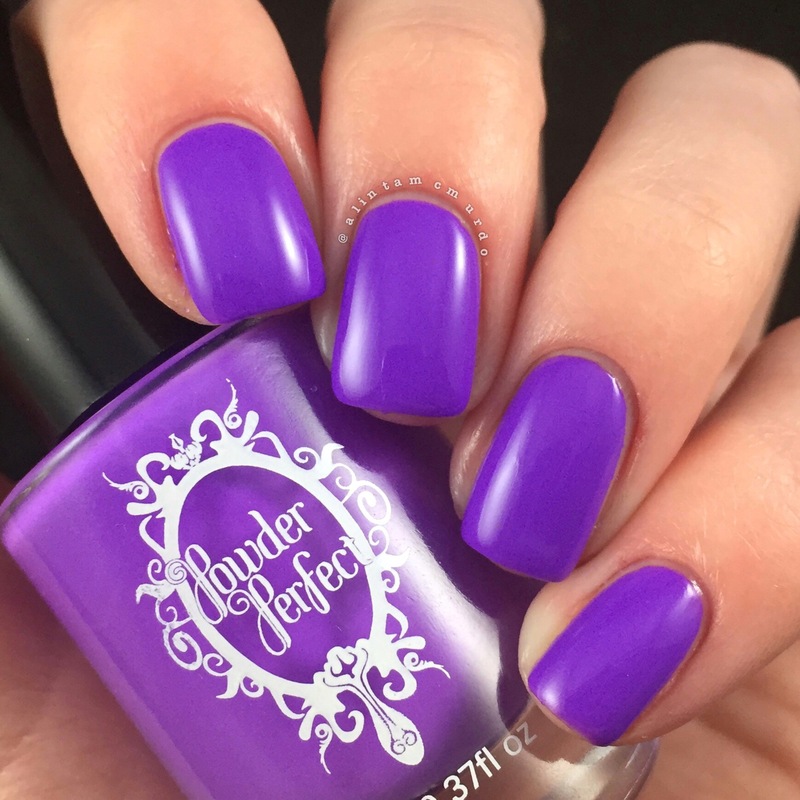 The original formula is workable, I just prefered to have it a little thinner so that I could get the polish closer to the cuticle (because my cuticle is very curved on my ring finger) – it shouldn’t be an issue for many people though. This polish is nice and opaque, so I only needed two coats. Puerto Rico is such a beautiful purple that should suit everyone because it isn’t leaning too blue or pink. I tend not to wear purple that often as I just choose other colours but I can see myself reaching for this when I want my purple fix. 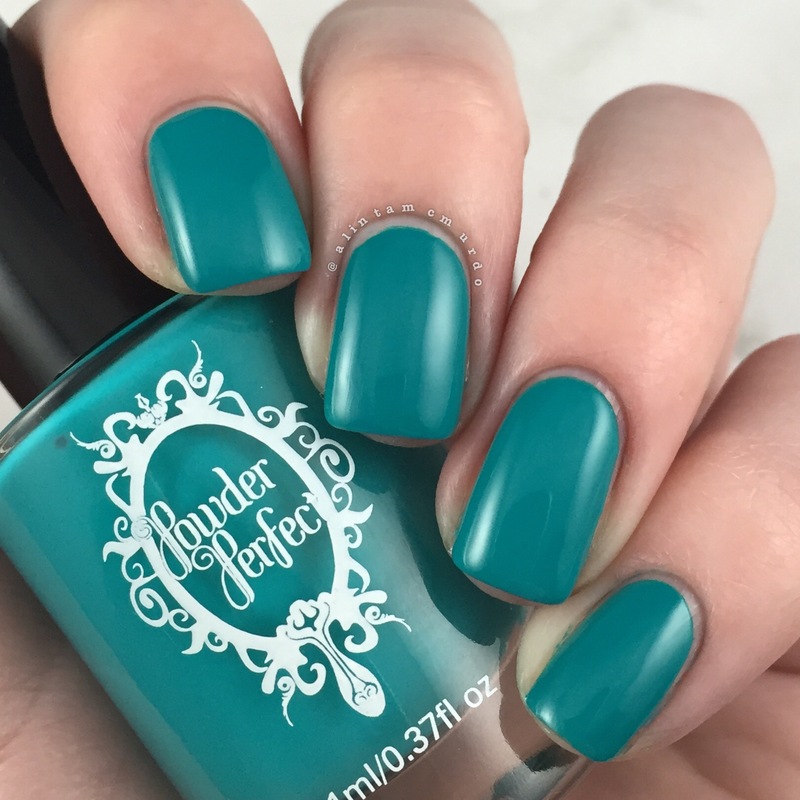 Bermuda is a bright teal cream that reminds me of the water you would see in the tropics. The consistency of this polish was in between the two others, being a little thick but very easy to work with (one drop of thinner in Puerto Rico made it the consistency of Bermuda). I used two coats plus top coat but you could potentially get away with just one coat as it is very opaque. I had no staining from this polish but I did use two coats of basecoat as blues and greens tend to stain my nails very easily. 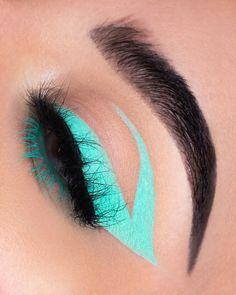 Bermuda is a lovely teal that doesn’t lean too blue or too green. 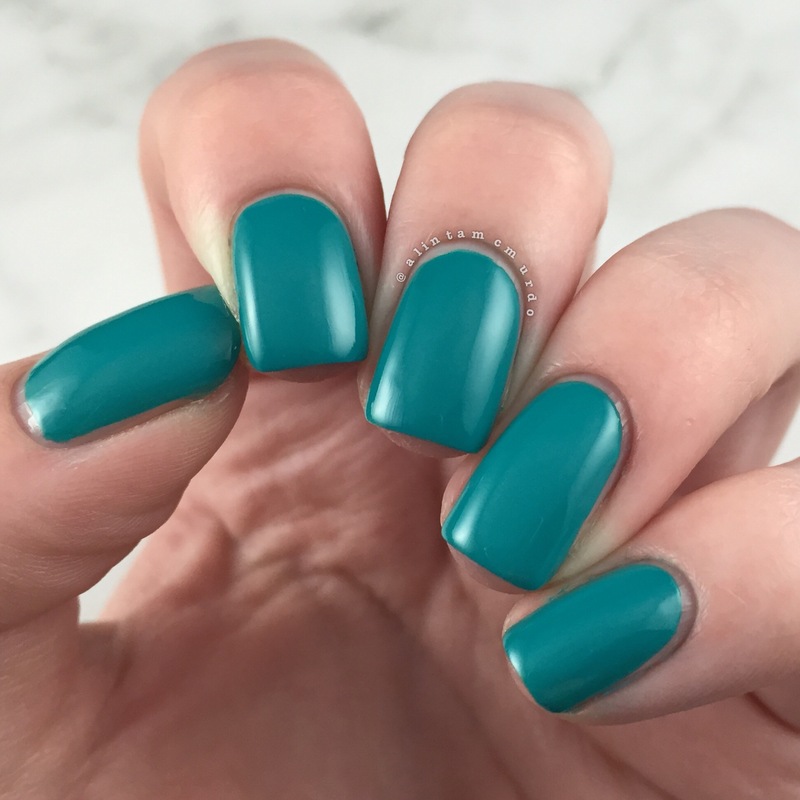 This is the polish that really makes me want a tropical holiday sometime soon. 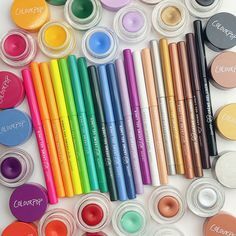 All swatches are topped with Powder Perfect Lightning Lady Top Coat and I also used Powder Perfect Smooth Sailing Ridge Filling Base Coat. I wear tested all three polishes with both Powder Perfect Lightning Lady Top Coat and my HG KBShimmer Clearly On Top Top Coat, and they all have a great wear time. Typically, my nails don’t hold onto cremes very well but I was able to get four days without any chipping from all of them. Even then, the chipping was very minimal, you could only see it if you looked very closely. I could easily get a week out of these cremes with them still looking nice – that’s very unusual for my nails. 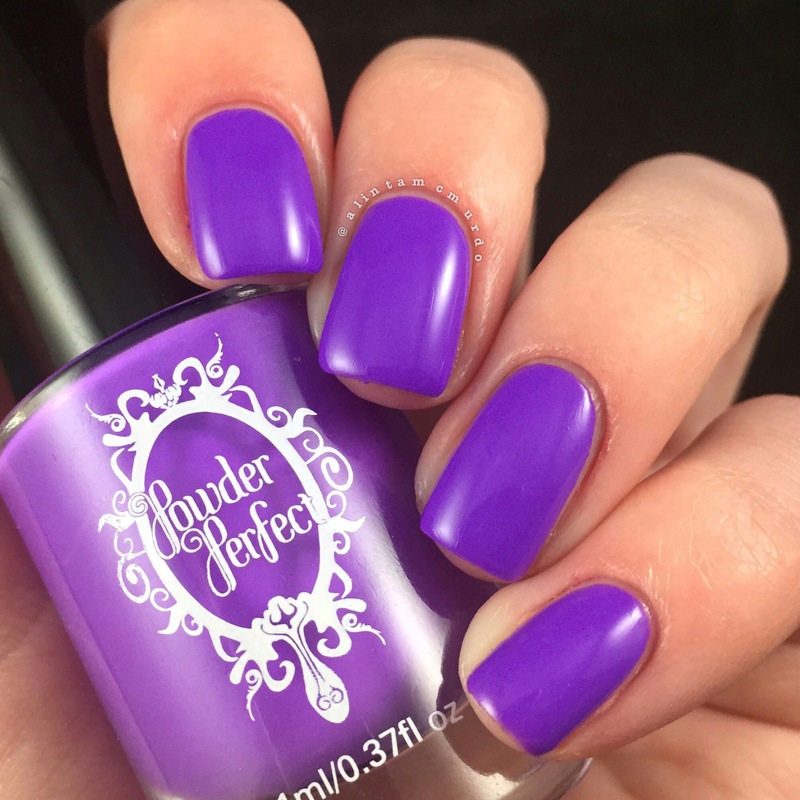 I also got sent the new Powder Perfect Lightning Lady Top Coat to review. This topcoat isn’t what I’m used to using as it’s on the thinner side and isn’t fast drying, but it is very easy to use. As you can see in the two photos above, the Lightning Lady Top Coat dries very shiny, more so than any other top coat I can think of. The thing I struggled most with is the slow dry time, I was still accidentally making dents in the polish an hour later (but it was dry to touch after 5 or so minutes). The slow dry time does mean that you won’t have problems with shrinkage and pull back like you can have with some of the fast dry top coats. Unfortunately, my shakes and other problems made it really hard for me to protect my nails for the long dry down time so I’m not sure how much use I will get out of it. However, the wear time is fantastic, so if you have the time to let it dry, it will do a good job of protecting your mani. I am in love with the Bermuda Trio, I will get a lot of wear out of all three colours. 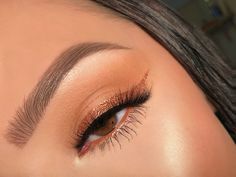 Some indie cremes I have tried (not Powder Perfect) can have problems with clumping pigment, be very streaky and have bad wear time, so it is great that there are now good options for cremes in the indie world. The long wear time of Florida, Puerto Rico and Bermuda will make me go back to them time and time again. I have a Powder Perfect Discount code that you can use to get 10% off both the Australian and International websites. Just put in the code ALINTA at checkout to get 10% off your whole order – this isn’t an affiliate code, just a discount code you can use. It expires at the end of July so don’t forget to stock up before then. 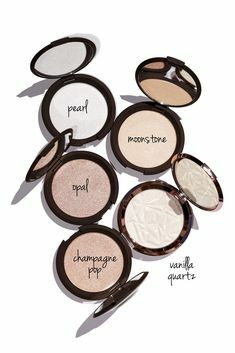 I hope this review of the Powder Perfect Bermuda Trio has helped you. Don’t forget to sign up to email updates so that you will be informed when my next post is up – which is my review on MILV Decals I have purchased from Powder Perfect, and I paired them with the Bermuda Trio colours. Will you be trying out the Bermuda Trio from Powder Perfect? 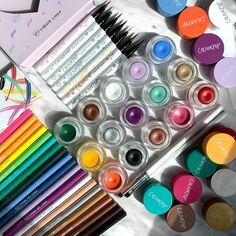 What a pretty collection, your swatches are gorgeous as usual!